There is not a huge amount of country in the makeup of this album, although there are elements, but there is certainly that slightly eerie feel that is detectable in the very best samples of 'gothic' country. Certainly two of the band members have alt. country in their background having been founder members of London based alt. country band 'Hey Negrita.' 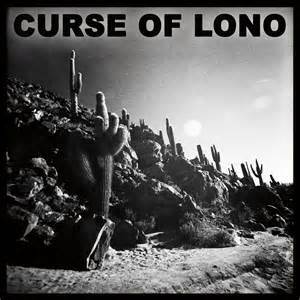 For the uninitiated they were a collective that sadly no longer exists, but don't worry, Curse of Lono are actually in many ways an extension of the Hey Negrita sound. I've seen this band described on their website as 'Cinematic southern gothic rock,' a more than adequate and accurate description that should give any reader some idea of the drama they can expect from this excellent album. The band consists of the two already mentioned 'Hey Negrita' men, Felix Bechtolsheimer on lead vocals and guitars and Neil Findlay on drums, with Dani Ruiz Hernandez on keyboards and vocals, Joe Hazel, guitars and vocals and Charis Anderson, bass and vocals, with all songwriting coming from the pen of Bechtolsheimer. The album was recorded at Gunfactory studios in London and was produced by Oli Bayston who also mixed most of the ten excellent songs. I reviewed their debut four song e.p last year, three of those songs being included on this debut album, and was hugely impressed by everything about the recording. They play with a tightness that will be the envy of many bands with a much bigger back catalogue and their sound is full and flows beautifully without ever drowning the song's lyrics and power. Bechtolsheimer's vocals are pleasantly warm and melodic, often sounding quite haunting and spacy on this recording that has incredible depth and even 'darkness' as befits an album that has the word 'gothic' in its description! The album opens with 5 Miles a song that starts with gentle acoustic guitars soon joined by Bechtolsheimer's haunting, spacy lead vocal before a crashing electric guitar sound drives into the mix with throbbing bass and percussion, giving the song a deep almost otherworldly and forbidding atmosphere. The slight distortion on the guitar gradually changes texture and the song takes on a much richer hue, slows down and then intensifies towards the end on a tale that has an epic feel. It is immediately followed by a hard driving chugging bass sound allied to Bechtolsheimer's vocals on Pick up the pieces supported by the dense, full, distorted electric guitar sound. The instrumentation gives the song its otherworldly feel but Bechtolsheimer's vocals have a grounding effect, almost clutching an earthly normality that will make the listener feel that the darkness of the sound is eased by the fact that a human is working his way through this 'gothic' world. There are some lovely slide guitar sounds on Just my head as the song opens slowly but gradually the speed increases and is soon joined by Bechtolsheimer's excellent lead vocals and eventually some haunting atmospheric harmonies with restrained keyboards in the background. Everything then solidifies with some tremendously powerful percussion and handclaps with the throbbing bass on yet another excellent song that, as with most of the songs on the album, rises and falls in intensity. There is a melodic guitar sound on Send for the whisky, with Bechtolsheimer's vocals joined by the deep throbbing bass and percussive hand claps that give the song a completely different texture. It gradually takes off with dynamic electric guitars, thudding percussion and even more dynamic harmonies, even including a jangling guitar in the mix. As with several songs on the album the percussive changes seem to enhance the tonal and atmospheric changes, at times keeping things on an even keel and then intensifying the depth of drama and spooky otherworldliness. With debut albums you always wonder how much experimentation has taken place and whether the sound is purely experimental or if it is what the band were aiming for and feel happy to have achieved. In the case of Curse of Lono I suspect the latter because 'Hey Negrita' were not total strangers to gothic elements, despite never plunging in as deeply as on this new recording. 'Severed' is a tremendous album that works beautifully and has a powerful originality much of which is imparted by the blending of the natural as breathing gothic feel and elements that if stripped back would leave an album of folksy country or Americana. In some ways 'Severed' echoes the depth and quality of Robbie Robertson's self titled 1987 solo debut and In case you're wondering that album is one of my all time favourites, a height that this tremendous album is working towards.